The Control Center allows you to change the mode of your Home. You can access the Control Center by tapping the icon at the top-right corner of the main screen. You can then tap the mode you want to select. The Active Monitoring mode allows you to record all events (noise, motion and air quality alerts) and to receive notifications for all alerts, based on the alerts sensitivity you’ve set up. You can still de-activate some of the alerts as long as you keep at least one type of alert active. If you want to de-activate all alerts, simply use the Do Not Disturb mode. The Do Not Disturb mode allows you to record all events (noise, motion and air quality alerts). However, no notifications are sent to you while you’re in this mode. It basically overrides all the notifications preferences you’ve set up. 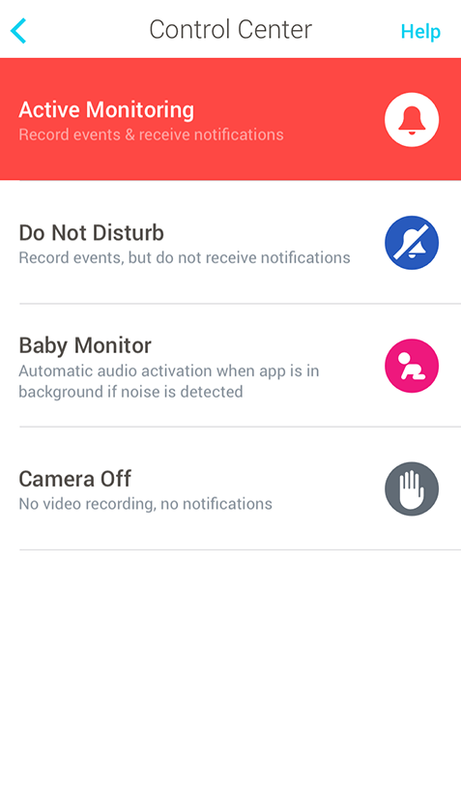 The Baby Monitor mode allows you to hear everything that’s happening, even with the Home app in background and your smartphone screen turned off. The Camera Off mode disables all video recording (whether you have subscribed to a Cloud Video Recording plan or not) and all notifications. You can choose to use this mode whenever you’re home, for example. Tap Manage at the bottom of the Control Center. Select the mode you want to trigger and the time and day at which you want to schedule it.